The attraction of denim for the modern, sartorial man is easy to understand. In an age when clothing is increasingly casual, making tailoring less formal through the use of casual cloths is attractive. It retains the benefits of tailoring - the elegant lines, the flattering silhouette - but avoids alternatives like shrunken sizing or bright colours and patterns. We have seen as a result, in recent years, a big growth in denim suits, cloths, shirts, even ties and shoes. As well as many indigo-dyed items that aim for something similar. I wear denim shirts regularly, but have tended to avoid it in tailoring. (As well as steering well clear of denim shoes and ties). This is because unfortunately, the very things that make denim attractive also make it difficult to tailor. Its coarseness and stiffness are what make it a pleasure to wear in, beautifully personal as it fades, and hardy enough to last for years. But coarse, stiff materials do not tailor well (particularly in a jacket, particularly when cotton). They have no drape and are harder to shape with the iron. They risk losing those very benefits of tailoring we're looking to retain. I made my first exception to this approach last year with Parisian bespoke tailor Cifonelli. The prime reason was the material. It is a heavy Japanese denim, but uses a slightly finer cotton than normal denims to make it easier to tailor. For me, this is a better approach than trying to reproduce denim in wool (as Zegna have done, for example), using lightweight cottons, or sticking with regular denim (see Timothy Everest, Richard Anderson and others). Its fineness means it won't wear in the same way as a normal denim, but it is the same in every other respect - the weight, indigo dye, the 3x1 weave. Unfortunately, Cifonelli aren't willing to talk about their supplier, so I cannot confirm how to source the same material. The style is a typical Cifonelli double-breasted, with wide, curved lapels. But I deliberately avoided their 6x1 configuration, where the lapel is cut to fasten at the bottom button. It's distinctive but - for me - a bit too showy. The buttons are dark-brown horn, the lining a matching silk, and the finishing (of course, being Cifonelli) absolutely superb. Ferdinando Caraceni used to say about cotton suits that the cheaper the material, the better the finishing should be - to raise it up and exalt it. This is certainly not a cheap material, but it doesn't have the luxurious richness of wools, and the Cifonelli finishing sits very well on it. There's almost no point mentioning the fit, it's so good. We did take three fittings at Mark's Club (where Lorenzo now sees clients) to get it perfect, but perfect it is. The only thing I might have changed was to have a softer shoulder - Cifonelli do a version of a shirt shoulder, and I might have been better going for that. It would have made the jacket a little less dramatic and easier to wear with more things. Although the lapels are pretty dramatic as it is. It's something I can always change later on. In other regards, the jacket is wearing in nicely. A heavy cotton is a wonderfully comfortable and reassuring thing to wear, even if it is less practical than wool. I'll be interested to see whether the material starts to wear and fade. This is likely to happen less at bend points - such as the inside of the elbow, where you would expect it on a regular denim - and more at the openings to the pockets, the edges of the cuffs and so on. I've already experimented a little with a pumice stone on one or two areas, to see how that wears the cotton, but I want to avoid any chance of that being too much, too artificial. I certainly don't want to start washing it, which I know Cifonelli can do and I've seen work with some success. Oh, and this is actually part of a suit - in that a pair of matching trousers was made at the same time. I'm unlikely to ever wear them as a suit (it's all rather too 1970s), but the trousers themselves are beautiful, and again incredibly comfortable. I'll include them in a separate post at some point. The cost of the suit was 6000 euros. Interior photography: Private White VC, taken during our talk on British manufacturing. 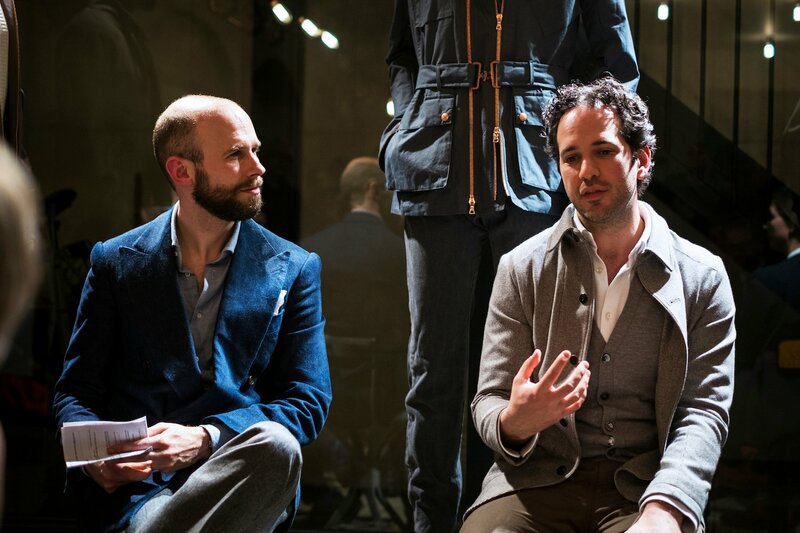 You can follow the discussion on Bespoke double-breasted denim jacket – from Cifonelli, Paris by entering your email address in the box below. You will then receive an email every time a new comment is added. These will also contain a link to a page where you can stop the alerts, and remove all of your related data from the site. Love it, denim amd milanese. Well done Simon! If this was a streetwear post I would’ve replied with 64x fire emoji’s… Wow I never imagined that I would like a jacket made out of denim after seeing multiple failed attempts from RTW brands. Cifonelli with another home-run. I have to say this is the antithesis of what denim as a casual material is all about. The cut of the jacket is great but it feels like you’re at the point of having commissions made for the sake of it as you have exhausted your options? 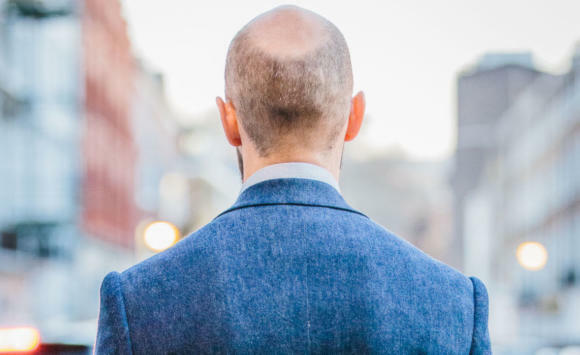 Surely once it fades the jacket will have the opposite to the desired effect of how casual clothing fades and you’ll find less reasons to wear it. I swear by the modern mix of smart and casual but this just feels too forced a collaboration and I’m not convinced it’s a good value proposition. Interesting, thanks Jeremy. I certainly haven’t run out of options, plenty of ideas there! I’m actually looking forward to the jacket fading and therefore looking more casual. Not sure why it would be the opposite of the desired effect? I think the formality of the cut against the way denim ages will mean it becomes obsolete and definitely wouldn’t work with the ‘matching’ trousers once the fades really kick in. It really feels too forced Simon. As mentioned, I don’t intend to ever wear the two together, though the trousers will also of course be worn and will also wear in. Jeremy you are just bloody old fashioned and thank goodness Simon has a wider and more versatile sense of style. Kudos to Simon for a fresh of fresh air. Absolutely love the denim jacket, just have to save up! a great idea you had, and the masterwork of Lorenzo Cifonelli made an amazing result. Many people would say it’s a sacrilege to turn this typical Cifonelli shoulder in a shirt shoulder (even if they can do it very well). You could also have thought of patch pocket? Anyway, it works pretty well, and I think it will be very interesting to see how it ages. I think it can be very interesting to wear it with your long sleeves polos also? Question – do you mean that you can have the shoulder altered from its current form to something softer? I recall reading in earlier postings that shoulder alterations are not possible. Am intrigued – certainly have some cotton jackets that I would love to soften at the shoulder. Amazing. Tailoring at its finest. I see you wearing more and more Simone Abbarchi shirts. Do you now prefer them to Luca Avatabile? This looks very good. It would be interesting to see a normal ‘full body shot’ in order to see how it looks with your trousers, shoes and so on. Double-breasted seems an interesting choice for denim. Could you explain why (other than it being C’s signature) you went for this over single-breasted with patch pockets, for example? 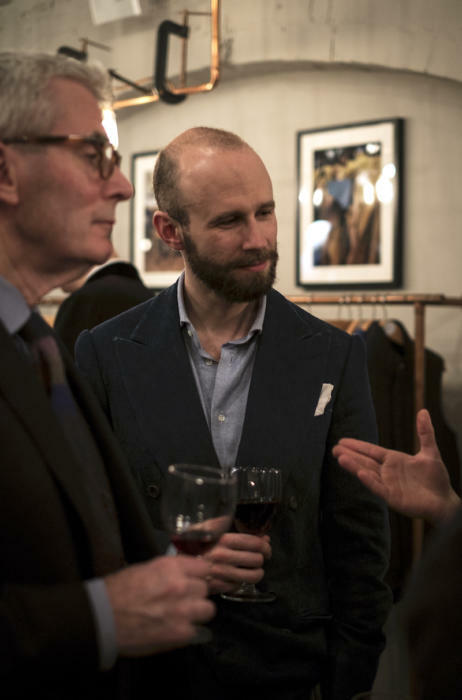 I suppose the combination of informal cloth and formal style/cut makes it more of a statement piece, but for the average reader, who has a less extensive wardrobe, would combining an informal cloth with an informal style of jacket be more versatile and better value? Sure, but less interesting for being sartorially less challenging ! I like the curve of the lapel…. but, denim tailoring always looks wrong to me. I can’t shake the image of Justin Timberlake’s epic double denim fail at the 2001 American Music Awards. 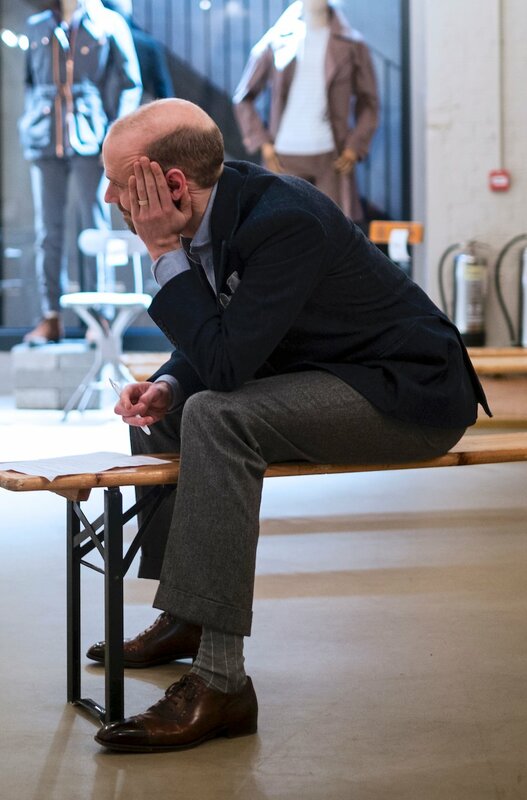 Are the trousers cut in a formal style, with a crease and cuff? Or something more casual. I assume the former, and have seen some nice images of it done on the satorialist. Would this be a style you would encourage for bespoke jeans? If they were really jeans, ie the same denim as normal jeans, then no. This a very chic jacket! But allow me to warn you against any temptation to change the shoulders. Understandably, keeping them creates a challenge. That is, how to tame the jacket, as it were, thanks to its singular aesthetics. I think you’ve found the right answer: dress it down; and yes, without even a tie in order to constrain it within assigned boundaries. But then, another challenge arises: a jacket to be worn as separate or not separate? Yet while the idea of wearing it as a separate is a good one, I do think that as a suit it could be a very nice option for less formal evenings. That is when you could make the most out of this suit! What I can’t figure out still is at which level of formality should the trousers be when you wear the jacket as a separate. Your choice here seems to work. Be that as it may, perhaps striking a middle ground might be a safe bet. I know it’s too vague! May I ask you how you have stumbled upon this fabric. This might be slightly off tangent, but I recently commissioned a navy sports jacket and a pair of light grey trousers, both in flannel, and I’m thinking about what shoes to wear with them. I recall that you’ve mentioned before that shoes should always be darker than the trousers, but does one have to take the jacket into account, especially when it’s significantly darker than the trousers? In my case, would you think that tan shoes (oxfords/suede loafers) may work well, especially when a more casual feel is desired? Or would you recommend a darker shade of brown? Dark brown would be more versatile generally, but tan could work here if the trousers are light enough. Even if they are worsted flannel? Especially so on the jacket – you need more texture, not less. And no putting the two together, the key is that they shouldn’t be the same. I thought worsted flannel would be similar to a cashmere in terms of texture? I see. Thank you for this important piece of advice. Would you say some hopsack for the summer might be too light for the trousers? I started my clothing, style – etc., pursuits by way of being a nerdy denim guy. I read all the denim dude things I could find. This all lead me down a path to bespoke clothing. For this reason (among others) I found this article of particular interest. Simon – please post some pictures down the line of the fading and wear process this jacket goes though. Would be very interesting. 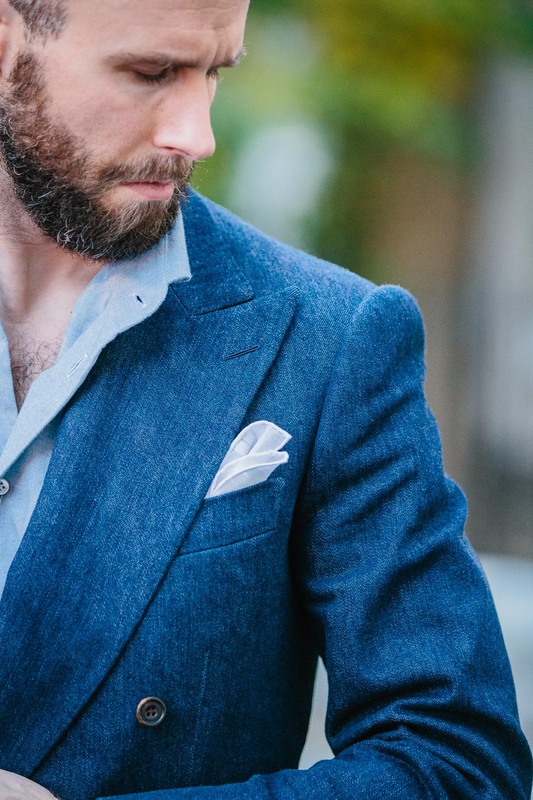 Double breasted is a fairly formal cut while denim is a casual material, albeit this example is a beautiful cloth. As the jacket ages and the denim fades,creases,etc the contrast between style and material will create even more discord. A more casual cut such as a 3 button single breasted with patch pockets would seem more in harmony with the fabric. Also 6000 Euros (almost 9000 CAD) seems an outrageous price for a denim jacket no matter how fine the tailoring. – it looks more and more like a Tom Ford milanese. – Caraceni wrote one should never put a milanese on a casual jacket. I do not agree but would like to know the rationale behind it, tradition? Regarding the shoulder: allthough I tend to think the Cifonelli shoulder head is generally too strong , I think one still needs a roped shoulder to match the strong lapel. Generally you might not do because it was seen as more formal and dressy. For the same reason, I can’t see how some recommends a polo to wear with this jacket. The polo collar would be ludicrous vs the jacket lapel. The shirt you are wearing on the pic perfectly does the job in my opinion. Hi Simon. I was interested in your comment about the challenge of tailoring with a stiffer denim. Quite recently you had a db jacket made by Ferdinando Caraceni in a coarse cotton. I would have thought that this material would be pretty similar to denim in terms of stiffness and drape. Are they quite different in reality? Look forward to seeing how your cotton jackets age. Partly inspired by that earlier post of yours, I’m currently having a sports coats made in a coarse Japanese selvedge (1/2 lined, 3 patch pockets and pick stitching). I expect it’s going to take a few years to beat it into shape. Will be interesting for me to contrast versus the aging of your jackets. I think denim and flannel is a bad combination. Not something I would even do. Very informal meets rather formal. Better with chino/linen/cotton. A lot of your outfits are a bit muddled in that sense although your skill is knowledge about making rather than style. Thanks. Hopefully the new book will change your mind on that last point! I mean no offence but I have to smile at the fact that you have commissioned an (expensive) finely tailored Canadian tuxedo. Perhaps the right occasion to go full kit will present itself for you someday. Next I’d suggest a Kenora dinner jacket! Might need some bespoke Platform shoes for that one! Irregardless of the following observations I’d like to thank you for being open to your vicarious readership by taking us along on commissions like this. Many interesting observations but for me the issue is the cut itself. For denim a slimmer line is required. You mention 70’s disco and that is where it may best be at home; slightly too long (one and a half inches), lapels too wide and too round on the belly, wrong pocket style (vs. patched), shoulders too roped. I think the cut of your A&S April 2014 check DB would have had a superior style for you and, long term, more wearable. The large swaith of stiff denim seems to swallow you. I like casual DB’s but they require a sense of casual, louche, sporty elan (see Lapo for an example) – I think the cut is too formal for the material to successfully deliver this commission. And as ever, all constructive comments welcomed and appreciated. I think the cut of the jacket is superb. You were absolutely right not to go with his 6×1 configuration – it is way too dandy – and that’s being polite. Leave the shoulders as they are – they look great and as you say, the finish is beyond good. All of that said, the most fascinating aspect of this project is the use of the cloth to bring a casual air to formal clothing without resorting to the bizarre ‘Pee-Wee Herman’ honey I shrunk the kids look or garish patterns. This experimentation with alternative cloths is a furrow worth plowing with a view to finding different alternatives for louche suits and in this regard how comfortable it is to wear, particularly in different climates, and how it ages will be absolutely key. I do hope you revisit the project regularly to keep us informed of these aspects. I’d also like to see it as a suit to see if you really are channeling your inner Jason King! When it comes to accessorising it, personally I’d go with a Friday Polo, a roll neck or a plain navy or grey shirt. If wearing just the jacket I’d probably go with navy cotton trousers and certainly when it comes to shoes it would have to be suede Chelsea or Desert boots. I didn’t spot it the first time I read this post, but picking up on the comments above regarding flannel I have to say I agree that it is probably not the best choice of cloth for a trouser to match with this particular coat, as they are at opposite ends of the spectrum in terms of formality. Whilst I think the silk thread on the lapel button is a neat touch, I would dial down the bottom half a touch. Thanks Nick (and others). It’s obviously a tricky combination, as the jacket is both informal in its cloth and formal in its cut. Very interesting reply! Do you have a rough idea yet of the range of fabrics for the trousers that would work with this jacket? The interesting thing about a jacket like this that mixes formal and informal elements, is that theoretically, you should be able to pair it with things that gently nudge it in one direction or the other. The dark green drakes corduroy might be nice, a little texture softening the transition from top to bottom. Also, dare I say it, a white chino could work well if you were that way inclined. Did you have to pay for this? Or did you receive it free / large discount? Always good to know with these posts. As discussed on various posts, I disagree – it doesn’t make any difference to whether I would commission it or how I review it. I have far too much already for price to be a factor. But yes, I paid with a discount. It’s a wonderful jacket, Simon! 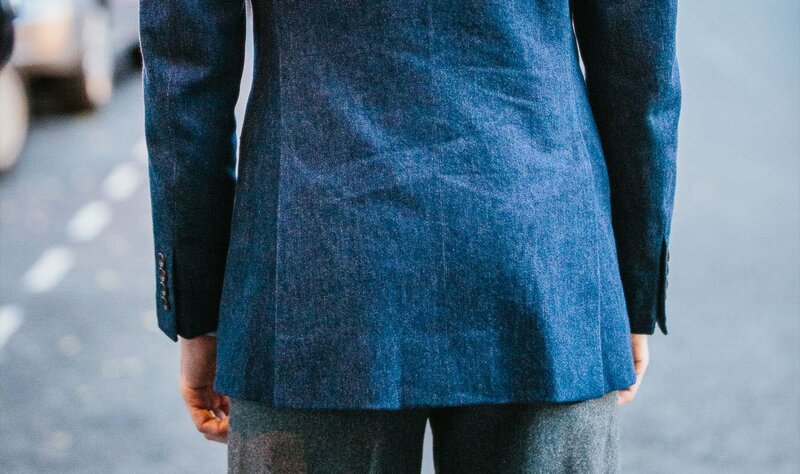 I especially like how the denim fabric doesn’t at all detract from the jacket’s quality as a tailored garment, but rather supplements it in a subtle yet uniquely powerful way. I appreciate how things easily could go terribly wrong here, especially considering the relatively formal and somewhat dramatic Cifonelli cut. I imagine the easier and safer (and thus predictable) option would be to go with a SB, soft shoulders, patch pockets, etc. However, this style offers something more unique and striking. Hadn’t the overall balance been spot on, the result may well have been quite outlandish. Fortunately it is anything but. The superb fit probably has something to do with this as well. I also think the roped shoulders and Milanese buttonhole fits well with this overall image. However I am not sure whether wear and tear and resulting fades will make the jacket even better or rather throw the balance off completely and make it much less wearable. Time will tell, I suppose. Looking forward to a future post on the jacket’s aging process. Well done! Very interesting! Reading your post, I started out very sceptical and ended with full acceptance. I do dislike denim and still believe that the jacket would probably be too stiff and heavy to wear, but the colour, the contrast between cut and material, the idea of something casual coming from (haute) tailoring, rally appeals to me. Cifonelli seems to be the only one able to make masterpieces like this ? Congratulations and thank you for sharing this great content. Does the $6000 Euros include VAT? I think without VAT and at current exchange rates, this makes for a pretty great deal for an American or anyone outside the Euro Zone. Thank you Simon for the post – informative as always. Love the blog! What would you wear with the trousers to this suit? I recently commissioned a pair of denim trousers very similar to this suit from Salva Ambrosi, and getting ready to pick them up. Trying to get ideas how to wear them. They look similar to this fabric, and are cut with formal styling – single pleat, side tabs, two inch cuffs. To be honest, I wouldn’t ever wear them with tailoring. It looks too fake. Instead, wear them with more casual things on top – a crewneck shetland sweater, for example. Thanks for the quick response Simon. Any ideas for spring summer with the denim “trousers”? Would a linen shirt and some sort of checked sport coat work? Polo? I enjoy your writing and appreciate your passion and dedication to fine craftsmanship. Alas, with this commission I think you have crossed the line into pandering to expensive indulgence. History will show the fashion for denim suits and shirts will quickly fade. Personally I read you writing to inform me on building a tightly curated curated wardrobe that will be stylish and long lasting. The names Mao Tse-tung and Dirk Diggler come to mind. Very disappointing. Would you recommend having dress Napolitain style trousers (2 pleats, large waistband, etc.) made from regular 10 oz denim ? Thanks ! Ok, thanks a lot ! Did you ever do a post on the trousers ? Thanks ! No. I’ve been making functional trousers to fill in a few things with Whitcomb & Shaftesbury over the past year, but haven’t really written about them. Perhaps I’ll do a post on all of them at some point. Great idea, I would find that particularly interesting ! Thanks! 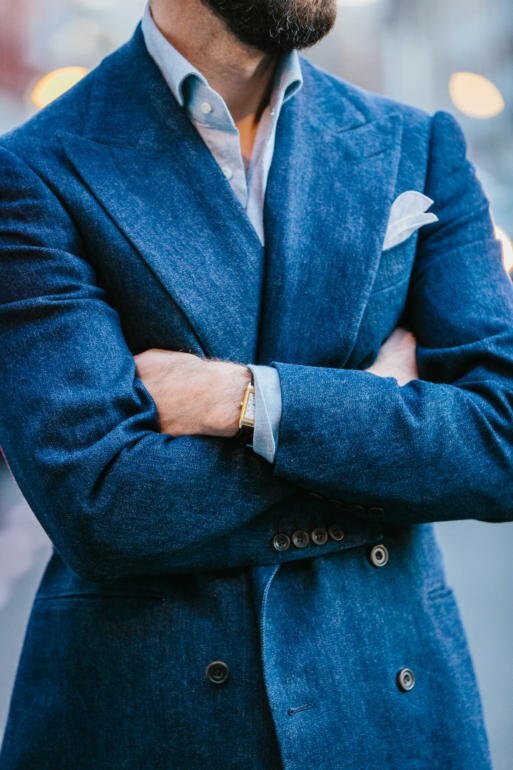 Hi Simon, what are your views on chambray for a sports jacket to achieve a similar kind of look but maybe not be as heavy and stiff as denim? Thanks. I’d be careful. 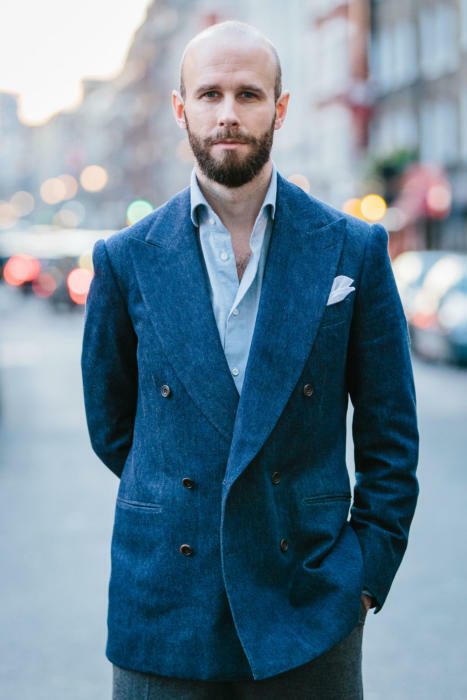 What’s referred to as chambray varies a lot, but the vast majority wouldn’t have enough body to make a good jacket. Perhaps a shirt jacket/safari. Have a look at cotton jacketings offered by the Italian mills, just in case they do something in that area – it would have to be woven and set to work as a jacket.